Buildings today are complex concatenations of structures, systems and technology. Over time, each of the components inside a building has been developed and improved, allowing modern-day building owners to select lighting, security, heating, ventilation and air conditioning systems independently, as if they were putting together a home entertainment system. But building owners today are beginning to look outside the four walls and consider the impact of their building on the electrical grid, the mission of their organization, and the global environment. To meet these objectives, it is not enough for a building to simply contain the systems that provide comfort, light and safety. Buildings of the future must connect the various pieces in an integrated, dynamic and functional way. This vision is a building that seamlessly fulfills its mission while minimizing energy cost, supporting a robust electric grid and mitigating environmental impact. In this Centric Chronicle post, we feature Stasis, a company providing building systems that address the winery owner's insatiable desire for greater building performance and innovation. In 1994, Integrated Structures, Inc. began research with a high mass, high insulation, fire and earthquake resistant construction system of its own design and was awarded two US patents. The work evolved in a series of designed and constructed structures, including; wineries, cold storage facilities, religious buildings and custom homes. What began as a structural system that could capitalize on free diurnal cooling energy stored in the thermal mass of the walls, evolved into a smart-building system using active radiant heating and cooling in the concrete “skins” coupled with a super-insulated core. To bring the construction system to market, Stasis, Inc. was created (the name comes from homeostasis which means to maintain a constant environment inside independent of the conditions outside). Integrated Structures, Inc. a licensed engineering firm provides design, engineering and permit drawings while Stasis Inc. provides the products and training necessary to construct the system. Today, Stasis brings smart-building systems utilizing patented Energy Mass Technology to winery facilities, and it's providing results. A winery using the Energy Mass™ envelope technology will save 80% of its cooling energy when compared to conventional winery construction. The Energy Mass™ wall is a site-built, engineered sandwich panel construction. It consists of a super insulated core, constructed with an insulated form, which is then filled with an expanding closed cell foam to achieve a vapor impermeable core of up to R-118 depending on core thickness. The unprecedented insulation is R-value is calculated before any thermal mass benefits are considered. The core becomes formwork for 3” thick concrete skins pneumatically placed on both sides. One or both of the shotcrete “skins” has embedded radiant tubing turning the entire wall into a radiantly active surface. Smart-building technology harvests “free” night-cooling, and actively controls the pumps and the temperature of the walls. This rock steady control of temperature allows a constant high humidity to be maintained without condensation, in turn keeping evaporative losses under 1%. The natural conditions of constant cellar temperature and high humidity explains why underground caves, though inefficient and expensive, have been used to ferment and age wine for thousands of years. The Energy Mass™ smart-building technology improves on this ancient, time tested solution by making space that is efficient and flexible, while stabilizing temperature and humidity with a precision exceeding even the conditions found in most caves. By employing radiant cooling with ice made from the sun’s energy, instead of evaporative coolers or air conditioners, the drying effects of the cooling system are eliminated, making humidification systems unnecessary. When coupled with the high insulation and high mass of the building envelope, both the temperature and the humidity can be held constant to a preset value. Evaporative losses from the wine barrels are reduced to less than 1%, which result in huge savings that will typically pay for the difference in the cost of the technology in less than 4 years of operation. Sustainable winegrowing practices protect the soil, air and water – elements that breathe life, and ultimately flavor, into the grapes and wines. Being good stewards of the land and good neighbors are principles many wineries and vineyards live by each and every day. Adopting environmentally and socially responsible practices and making them an integral part of how business is done, ensures the health of the land, their communities and industry for generations to come. Sensitive architecture and design, as well as building strategies that make use of natural and recycled materials are a part of responsible practices. 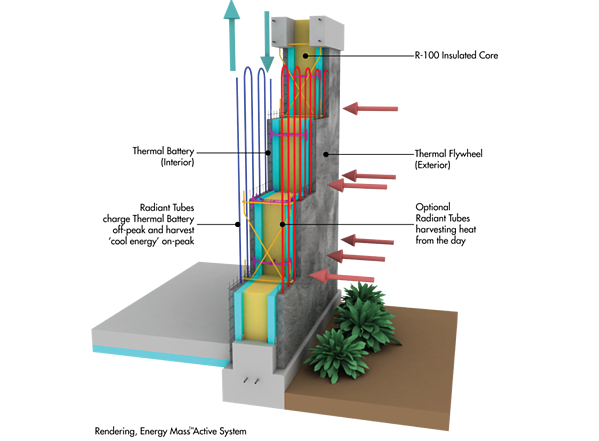 The Energy Mass™ system employs a massive, super insulated wall to reduce cooling energy consumption by 80%. Additionally the wall, made from concrete, rebar and foam insulation is 100% recycled or recyclable materials. Earthquakes, wild fires and other disasters are an unfortunate fact of life and business. Investing in a building with superior fire resistance and strength could be the difference between recovery and ruin. Imagine a building that won’t burn or be damaged in an earthquake, protecting your investment and allowing your business to continue without disruption. The insurance payout from a natural disaster may compensate the immediate losses, but it doesn’t cover the brand recognition and shelf position for the three years it will take to build a new building, crush, age, and bottle the wine to go forward. Continued operation with minor losses is far preferred to total loss and rebuilding. It is wiser to invest in a safe, secure building and reap the rewards of lower insurance premiums, which can result in substantial savings over the life of the building. Does an Energy Mass Building seem too good to be true? Share your thoughts with us in the comments section below. If you want to learn more about this exciting building system, please check out the Stasis website.